Last Wednesday I was lucky enough to attend a workshop on "The Fundamentals of Trauma Informed Care" by Laurie Lockert, MS. I won't rehash all the info that is available on other parts of this website, but I do want to post some very helpful points she made. Attached is a handout about the neurobiology of trauma and the brain. I love that POCA/POCA Tech is aligning with the practice of trauma-informed care. There's a tendency in our society to play down the negative effects of bad situations (especially those inordinately experienced by people from low-income backgrounds). If it's not a wounded soldier screaming in a corner having flashbacks to combat, many Americans won't believe someone has experienced trauma, and re-experiences aspects of that trauma repeatedly through the course of daily life. Just the other day I convinced a friend who was suffering from anxiety and headaches to try acupuncture. This friend has a job placing them firmly in the upper middle class, has an ivy league education, and lives with a loving partner. Most people would look at this person and think they had it all. But when it came time to deal with the headache, this person just couldn't handle even making an appointment, the stress of it was too much. The fear of interacting with medical professionals and being in any kind of doctor's office was palpable and intense. Being able to say, "This is nothing like a doctor's office, except for the health history form. You come in, talk a little to the acupuncturist out in the lobby (so you can easiry bolt before you commit to it), keep your clothes on, sit back in a recliner, hang out for a while, and then leave when you are ready. 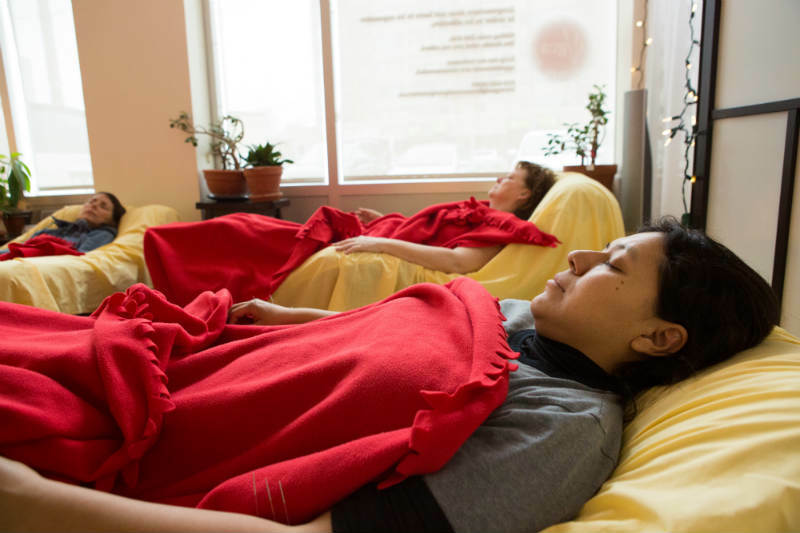 You have all the power," was huge, and the control that the patient has in the community acupuncture setting made it possible for this person to seek help. If even people who "have it all" are afraid or incapable of seeking help due to trauma, only imagine what those who have less are going through. I am really thankful for trauma-informed care as both a practitioner and as a patient, because it means less chance of anyone feeling uncomfortable while trying to ask for help.